George Crile’s rise to surgical prominence began in 1897, when he won the prestigious Cartwright Prize of Columbia University for his work, “An experimental research into surgical shock.” This work originated in Crile’s experience of treating railway and factory accident victims in his Cleveland industrial practice. 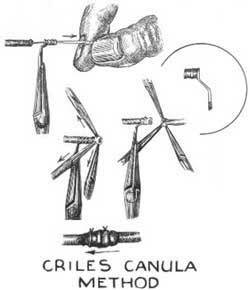 Crile’s interest soon broadened to encompass the subject of shock accompanying both trauma and surgery. Research along these lines began in earnest when Crile visited London in 1895 to study with Victor Horsley, a world-renowned pioneer in physiology and surgery of the nervous system. Upon returning to Cleveland, Crile continued experimentation to better understand the phenomenon of shock, and to devise means to avoid, alleviate, or diminish its devastating impact. George Crile is sometimes credited with performing the first successful human blood transfusion at St. Alexis Hospital in 1906. He was not the first to do so, but did devise methods of transfusion, and he pioneered its use in surgery. In Hemorrhage and transfusion (1909), Crile analyzed the physiological effects of acute hemorrhage and described several modes of treatment, including blood transfusion. He provided detailed instruction for transfusing directly from donor to recipient, connecting their blood vessels by means of his cannula for anastomosis.